Short, occasional pieces that are best ingested in small bites. Cannadine, professor of history and director of the Institute of Historical Research at London University, is one of the foremost historians of modern Britain. His Decline and Fall of the British Monarchy and Aspects of Aristocracy prove him to be a sharp analyst of those anachronistic institutions. Because of his chosen subject matter, his work often has overtones of twilight and nostalgia with just a shadow of decadence (in the British sense) thrown in for good measure. This collection of short pieces is no different, except that it focuses on personalities rather than institutions. It is, in the words of the author, an “unavoidably and unapologetically festive and high-spirited book.” The essays—all composed over the last decade—were originally for such publications as the London Review of Books, the New York Review of Books, the New Republic, the New Yorker, and the Times Literary Supplement. 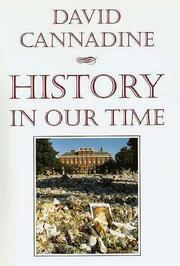 They are loosely grouped into three sections, “Royals in Toils,” “Hindsight’s Insights,” and “Persons and Personalities.” Their greatest strength lies in Cannadine’s insistence that even the most current events (e.g., the death of Princess Diana) must be seen through the prism of history. Far more insightful than the usual essay, yet mercifully brief, they are history lessons with a light touch. From the monarchy to suicide to intellectuals and class, the British sense of style, decorum (or lack thereof), and form constantly remind the reader why the British consider themselves aloof from the “Continent.” American readers will be interested in Cannadine’s pairing of Thatcher-Major with Bush-Clinton, but will perhaps be left a bit adrift on the discussions of the historian A.J.P. Taylor or Lord Beaverbrook. Some attempt at tying these many threads together would have been helpful, and the title is just slightly pretentious, sounding like an echo of Winston Churchill. Entertaining and enlightening.